The League of American Bicyclists has named RIT a Bicycle Friendly University. The League of American Bicyclists has named Rochester Institute of Technology a Bicycle Friendly University. 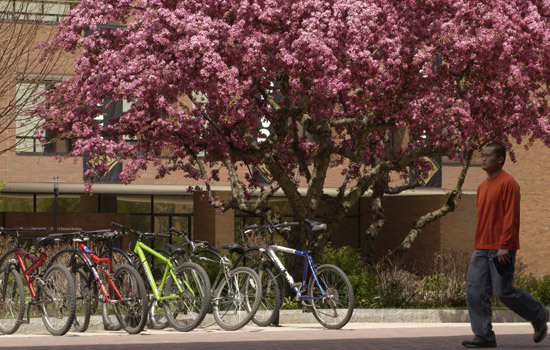 The Bicycle Friendly University program recognizes institutions of higher education for promoting and providing a more bicycle friendly campus for students, staff and visitors. RIT was one of nine universities added to the list at the bronze-level, which was announced Oct. 24. RIT joins 44 other universities from 25 states, including Cornell University, Duke University and Yale University. Promoting cycling as a means of transportation has been one aspect of RIT’s sustainability mission, which includes the dissemination of reusable water bottles to all incoming freshmen. “Improving and promoting alternative transportation on campus and throughout the community is such an important part of our sustainability efforts, especially since the emissions associated with commuting to campus make up almost a third of RIT’s total greenhouse gas emissions,” says Enid Cardinal, senior sustainability advisor at RIT. The Bicycle Friendly University program was created with the goal of inspiring action to build healthy, sustainable and livable institutions of higher education. Applicants are evaluated in five primary areas: engineering, encouragement, education, enforcement and evaluation/planning. The specific criteria include things such as secure bike parking, bike lanes and paths and the distribution of safety information, among others. Vercauteren says that covered bike racks, dedicated bicycle paths and the presence of bike racks on the front of RTS buses were all factors that contributed to RIT earning this distinction. Rochester was recently named a Bicycle Friendly Community by the League of American Bicyclists.